Despite having a low-stress weekend at the Cape, I didn’t get much reading done. I’d be surprised, but then I remember how people always seem to be very intent on having a conversation with me the moment I pull out the bookmark. All I really got around to reading this weekend was most of a Terry Pratchett Discworld novel, Men at Arms , which I’m reading for a craft annotation this month. I have never read Terry Pratchett before (which I realize is weird since I love fantasy so much) and boy do I regret it. Between wordplay, footnotes and wackiness, this book is funny, and added to that I’m really enjoying the characters and the world set up. I have to read another Terry Pratchett novel later this semester, but I don’t think that’ll be the last one I pick up. What are you guys reading this week? Have you found anything new and fun? I am currently reading an ebook called “Guardian Angel” for review and so far it is really mentally delicious. The other book I am reading is called “Thinking” which is a small textbook for a course I am taking. I already think too much so reading this book is in the right place in my mind. Glad to hear you reading something good. 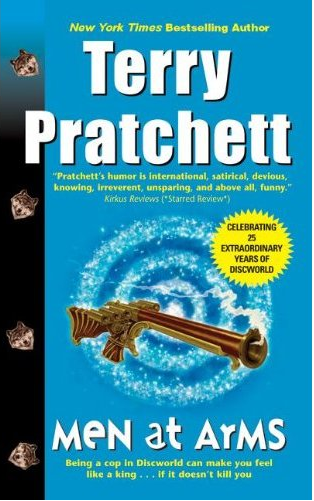 Terry Pratchett is a wondeful author – and his collaborative book written with Neil Gaiman “Good Omens” is superb; in fact that is what I have been reading this week. I’ve recently discovered I love Neil Gaiman, too, so I really want to read Good Omens.